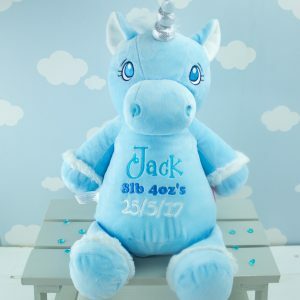 Every baby boy dreams of having his own magical companion in his early years, make his dreams come true with our Personalised Blue Unicorn Soft Toy - the perfect snuggle buddy for your Prince! 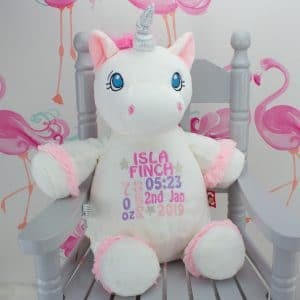 This Unicorn Soft Toy can also be personalised to make an excellent memento for years to come - check out the product gallery for our different design templates! Every little girl dreams of having their own unicorn, make her dreams come true with 'Aurora' the unicorn - the perfect companion for your princess! Aurora can also be personalised to make an excellent memento for years to come, check out the product gallery for our different design templates and simply fill out the relevant information in text boxes below!